Jonathan Stone Born at Union Square on the family's ancestral land, Jonathan Stone was a chaise body maker. In 1850 he married Emma, and they lived on the Stone block until 1870. He owned the land on the east side of the street. Jonathan died 27 June 1896. Shipper at Union Glass Co.
Before retiring, Thomas owned a saloon and restaurant in the basement of the old Masonic Building in Union Square. He was a power in local politics and a Chrstian Scientist. He spent his last years in a wheelchair. Amos was in the Searsport, Maine, line of "blue water" captains. He went to sea as a boy, and by 1896 was captain of the Lucy Nichols, which traveled between New York and Hong Kong. After that, he commanded steamships with the American-Hawaiian Steamship Company. During World War II, he was in the Merchant Marines, conveying war supplies and food; he was captured by the enemy in the North Sea, but later released. 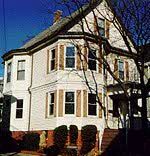 16 Aug 1948: Purchased the house, mortgage of $6,500 (paid off in 1953). Likely rented before buying the house. Catherine T Grogan Born ca 1877, died 1960?